Anthocyanins, the pigments of the red grapes, are extracted during the grape maceration phase during alcoholic fermentation and then also in the case of possible post-fermentative maceration. The CDR WineLab® method for the determination of anthocyanins was developed on the basis of the reference method (Ribéreau-Gayon and Stonestreet 1965). The CDL WineLab® method is simpler to perform and the analysis time is considerably reduced compared to the reference method, which makes it possible to evaluate the concentration of anthocyanins in must or wine directly at the winery without the need to perform tests in a laboratory using specialist staff. 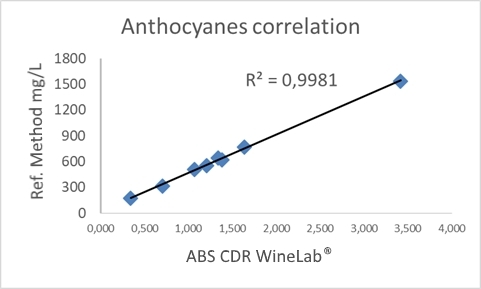 Determination of the total anthocyanins is part of a broad analysis panel developed by the CDR laboratories, implemented on CDR WineLab®, which offers the oenologist a precise and accurate control of both the polyphenolic extraction phase in red wines (maceration), and the subsequent polyphenol stabilisation phase (and therefore of colour stabilisation) that occurs with the micro-oxygenation process. Anthocyanins are the pigments of red grapes. They are found in the vacuolar juice of the skin cells and only exceptionally in specific vines in the pulp. The analysis is based on the discolouration of anthocyanins in the presence of SO2. Analysis of the discolouration carried out by SO2 is measured at 520 nm in end-point and is proportional to the concentration of the anthocyanins present in the must/wine sample, expressed in mg/L. Total Anthocyanins was last modified: February 25th, 2019 by CDR s.r.l.